Kenai: Koda... your mother's not coming back. Koda: [playing with his reflection in an iceberg] Skinny... fat! Skinny... fat! Koda: ...my eyes were watering, and my tongue was swollen, and from that moment on, I was more careful about what I lick! Koda: ... my eyes were watering, and my tongue was swollen, and from that moment on, I was more careful about what I licked! Koda: Oh, that reminds me! Last year at the Salmon Run, my friend Bucky TOTALLY dared me, but I'd heard about this OTHER cub who stuck HIS tongue to an iceberg, and then he started to float away, and so to save him, they had to like rip off his tongue, and so, now he hath to tog like thith all a time! Koda: I think their horns are screwed on too tight! Koda: But we pinky swore! Koda: Scared you, didn't I? Kenai: There's scared... and then there's surprised. Koda: What are you doing? Guess you didn't see the trap, huh? I saw it from a mile away! You must be pretty embarrassed! Koda: Don't worry... I won't tell anyone! Kenai: Oh, wait, wait, wait, wait, wait, wait... OW! Kenai: No, just- Ow! Stop it! Ow! Ooh! Would you just- Ow! Get... get... hey... STOP IT! Koda: It's no use. The only way to get down is to chew your own foot off! Rutt: Oh, gee! I think he's seen us, eh! Now what? Tuke: Act like we're not here. Rutt: Oh. Ah, we're not here! Tanana: Kenai, I have been to the mountain where the lights touch the earth, and the Great Spirits have revealed to me your totem. To become a man, your actions must be guided by one thing: Your totem is... love. Yes, love. Kenai: [disappointed] The bear of love? Kenai: Wrong? Our brother is dead and it's because of THAT monster. Denahi: I don't blame the bear, Kenai. Kenai: [of his totem] The bear of love? Kenai: [whispering] Who wants to trade? Tanana: Let love guide your actions, and one day, you'll be a man, and will place your mark next to those of our ancestors. Young Goose: Are we there yet? Goose: Don't make me turn this formation around! Chipmunk: Well, they were right here a second ago, and now they're gone! Second Chipmunk: [with stuffed cheeks] Yeah... that's really weird, huh? Chipmunk: So, you're telling me YOU didn't eat 'em, and you have NO IDEA where they are? Kenai: H-hey! You! You just talked! Kenai: How'd you DO that? Chipmunk: I KNEW you had them in there! Rutt: My name's Rutt. This is my brother Tuke. Tuke: What's he getting all worked up about, eh? Rutt: I don't know. Maybe the goose pooped on him, eh? Kenai: I'm not a beaver, I'm a bea-, no, I mean I'm not a bear, I'm a MAN! Rutt: Hey, you know what this calls for? A pile of delicious barley and amberweed on a cool bed of malted hops, eh. Kenai: I was transformed into a bear, magically. I was lifted into the sky by my brother. Tuke: [fake cough] You're crazy! Tuke: [fake cough] No, a fruitcake! Tuke: [fake cough] No, that bear over there! He's crazy! Tuke: Who ever said you were? We understand. either. Tuke: Yeah, we're not really moose either. Tuke: No, we're more... like squirrels. Rutt: Oh, yeah. Beauty, eh? Well, he's a squirrel. I'm more of a pure-breed wolverine. Look at these cuspids. Rrrr! Tuke: Give him some room. Kenai: Why am I even talking to a couple of dumb moose? Tuke: No, we're squirrels, eh? Rutt: Oh, I wouldn't go that way, eh. Rutt: Uh, there was a reason. Tuke: Well you brought it up. Tuke: So, you think of it yet? Rutt: No, but it's driving me nuts too, eh? Rutt: Go away, eh? I'm eating twigs. Rutt: Go away, eh? You're breaking my concentration. Rutt: I can't, I'm still digesting. I'll get cramps, eh? Rutt: Ah, gee, he's after us! Tuke: Get going, little brother! Kenai: [Scoffs] Spirits. Thanks for your wisdom. Tanana: I don't speak "bear". Kenai: Koda... I did something very wrong. Kenai: Sitka! Sitka, are you there? Sitka! Sitka... please, Sitka... I don't know what else to do. [telling stories at Salmon Run] Koda: This year, I watched my Mom in a life and death struggle against all odds, battling possibly the most fiercest creature on the face of the earth. Okay, who's next? Koda: My name's not Kid. It's Koda. 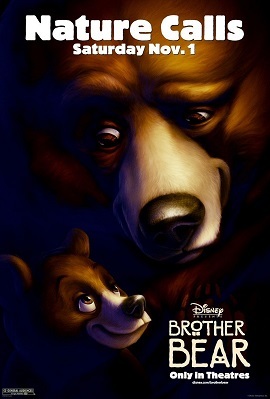 Denahi as an Old Man: My brother Kenai went on to live with Koda and the other bears. He taught me that love is very powerful. And I passed on the wisdom of his story to my people. The story of a boy who became a man... by becoming a bear. Koda: [Singing] Tell everybody I'm on my way! New friends and new places to see! With blue skies ahead, yes, I'm on my way! And there's nowhere else that I'd rather be! Tuke: Do you wanna play "I Spy"? Tuke: Okay, I spy something... green. Rutt: Okay, my turn. I spy something... tall. Tuke: My turn. I spy something... with bark. Rutt: Okay, I spy something... a vertical log. Rutt: But I didn't spy anything! Tuke: Ohh, let's play something else. Tuke: [To Rut] Hey, I can change...c'mon I can change...I CAN CHANGE! Sitka: Now, the quicker we get these fish, the faster we're gonna get to your ceremony. So let's all just try and get along for a few hours! Okay, Denahi? Kenai: [already in his boat] So? What are we waiting for? Spirit Voices: [in Inuit] Come with me, I'll take you now to a place that you fear. For no reason why, your heart has turned away from me, and I will make you understand. Everything will become clear to you when you see things through another's eyes. Everything will become clear to you whatever's meant for you, you will find. Come with me, I'll take you there to a place where you'll see everything you need to be the one you need to be, and all of those things that you feared will disappear from you in time. Kenai: Koda, there's... something I ought to... you know that story you told me last night? Kenai: Well, I have a story to tell you. Koda: Really? What's it about? Kenai: Well, it's kind of about a man... and kind of about a bear. But mostly, it's about a monster. Tug: Okay, let's see... the most interesting thing that happened to me this year... hmm... I have to... Oh! I know, I know, I know, listen to this: I'd say it was when I finally knocked down that tree that was blocking the view from my cave. Now I got a family of chipmunks staying at my place! Koda: If the snow's white, then it's all right. Yellow or green, it's just not clean. I learned that one the hard way. Kenai: Keep all that cuddly bear stuff to a minimum, okay, kid? Tanana: Oh, my, my, my my... Sitka must have something really big planned for you, yup, yup, yup. You're gonna get a whole new perspective on things! Oh, do you see in black and white, or color? Kenai: Yeah, I get it. You know, for a change, maybe they could just leave things alone. Koda: What do you mean? Kenai: My brother's a spirit, and if it wasn't for him, I... I wouldn't be here. Koda: You have a brother up there? What happened to him? Kenai: He was killed by a bea... by a monster. Koda: What's your brother's name? Koda: I always wanted a brother. Denahi: Just tie it up. Ram: No, you shut up! Echo: No, you shut up! Ram: [tired] No... YOU shut up! Echo: No... YOU shut up! Rutt: You wouldn't like us, eh. We're really gamey. Tuke: Ya... eat hoof-for-brains over there. Rutt: Oh nice, eh. pine-cone breath! Rutt: You went too far that time. Kenai: Yeah... I guess the spirits messed up on both of our totems. Sitka: You know, I felt the same way when Tanana gave me mine. Kenai: Get out of here. Sitka: No, really. I said, "The eagle of guidance? What does that mean?"... But now that I'm older, I know it's about being a leader... and keeping an eye on you two. Kenai: ...I just want to get my hand print on that wall. Sitka: Just be patient, Kenai. When you live by your totem... you will. Mabel: This year, I lost my dear husband, Edgar. Edgar: Stop tellin' everyone I'm dead! Tuke: I love... dew. Rutt: I love dew too. Koda: I'm practicin' my moves! Denahi: Whoa... Did I say little? Tuke: Get out, eh. I'm driving. Rutt: Wha... when can I have a turn, eh? Tuke: It's not as easy as it looks. Now just watch what I do, okay? Rutt: Well, let's get a back seat or something. It looks like ya hunted me. Denahi: Killing that bear won't make you a man. Kenai: Oh, NOW you're trying to be wise? Denahi: I'm trying to follow my totem. Why can't you do the same? Kenai: You really think love has anything to do with being a man? A MAN wouldn't just sit here and do nothing. Sitka: [to Kenai of Denahi] Hey, bonehead, just because his totem is wisdom doesn't mean he's wise. I mean, look at him. Tug: Yeah, try not to scare off the fish there, buddy. Mabel: If only EDGAR was alive. Edgar: I told you, woman, I'm right here. Bo: I love you, buttercup. [looking at a cave painting of a hunter stalking a bear] Koda: Those monsters are real scary. Especially with their sticks. Rutt: I can't believe you totaled a mammoth. Tuke: Oh, come on, it was in my blind spot! Denahi: THERE he is. Ha ha! Come here, lover boy. Denahi: Aw, Kenai wait... I'm sorry. Denahi: Your totem... I think it's really great. Kenai: [throws a band of flowers on his head] Now when you skip around loving everybody... you'll smell so sweet! Sitka: WELL, isn't this nice. Instead of fighting you're giving each other flowers. Denahi: Yeah. Isn't it lovely? He's so in touch with his totem already! Sitka: Hey, dog breath, go take care of the fish. Koda: When I get in a fight, I go all crazy, and I'm a raging ball of brown fur! Tanana: Kenai, love is the most precious of totems. It reveals itself in unexpected ways. Koda: Hey, I don't wanna brag or nothing, but I got some moves. Koda: Yeah. Now, this first one, well... it's just a little something I like to call... the Slasher. And this, I call... Flying Fury of Death. Kenai: [mock terror] Ah! The hunter's coming back. Kenai: Enough with the stories. I don't care about the time you and Binky found the world's biggest pine cone ever. Koda: First of all, his name's Bucky, not Binky. And second, it wasn't a pine cone, it was a pine nut, and it was huge, even bigger than your fat head. [after a caribou stampede] Kenai: Never try to milk a caribou. Tuke: How's it going, bear? Kenai: Don't call me that. Tuke: Sorry, um... Mister Bear? Rutt: Sorry! You've been replaced with my dear brother... gee, I forget you name, what's your name again...? Rutt: See? He's had enough of you too, eh.